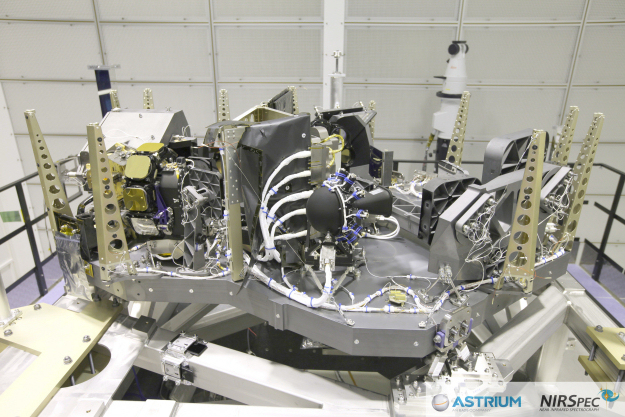 The Near InfraRed Spectrograph (NIRSpec) is one of four instruments on the James Webb Space Telescope (JWST). NIRSpec is a multi-object spectrograph capable of observing more than 100 astronomical objects simultaneously in a large field of view of ~ 3 arcminutes × 3 arcminutes. It will support JWST's four main science themes by providing low (R~100), medium (R~1000), and high-resolution (R~2700) spectroscopic observations. NIRSpec measures 1.9m × 1.3m × 0.7 m and weighs approximately 200 kg. It is an all-reflective system with a total of 14 mirrors, seven interchangeable dispersive elements and eight interchangeable filters. The black dome and horn-shaped assembly in the centre foreground is the calibration assembly. This will be used for on-orbit calibration and monitoring the performance of the instrument. To the left, with one silver- and three gold-coloured squares arranged around a cylinder, is the grating wheel. The filter wheel can just be seen at the centre, towards the back of the shot, with two of the eight interchangeable filters showing. The camera, which focuses the light beam onto the focal plane assembly (not visible), is in the large silver box at the back left of the shot. NIRSpec is developed by ESA with EADS Astrium Germany GmbH as the prime contractor.